Following on from our long drive from Broome to Kununurra, where we visited the Poo Ponds before catching up on sleep, we headed on north. We were soon over the border and we left Western Australia to enter the Northern Territory. We didn’t have time to stop and visit the Keep River National Park this year, because we had to get ourselves as far as Palmerston before sunset and we had just lost 1 1/2 hours as we crossed the border. 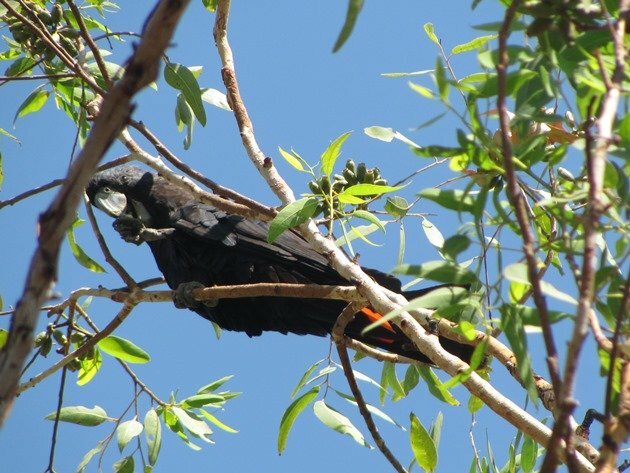 There were some brief stops at the river at Timber Creek and at Victoria River Crossing and also at Katherine, but there was a lot of country to cover to get to Palmerston and birding that area will have to be another adventure. We arrived in the city of Palmerston as the sun dropped and there are some major changes since we lived here from 1996-1999. We remember a small town with few tall or flowering trees and it has completely changed. The population of this satellite city to the south of Darwin has doubled since we left and it is a city of parks, lakes, a lagoon and plentiful bike paths. There is a bike map that covers the city of Palmerston and Darwin and the route in between. 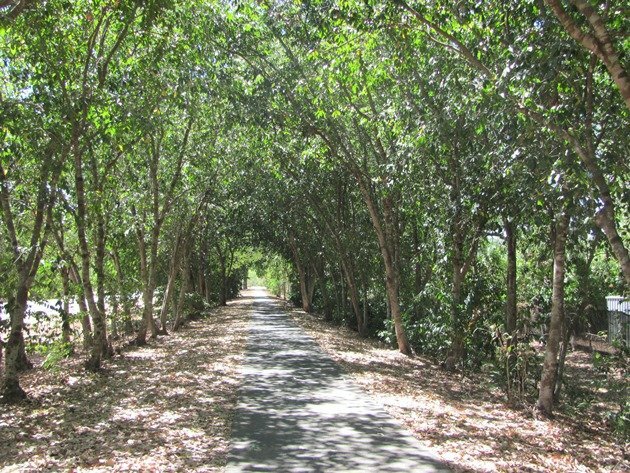 I have cycled much of the bike path around Palmerston since we arrived and some sections are quite shaded as in the above photo. All of the street trees are incredibly tall now and most are in flower or fruiting and of course this makes for some great birding. In fact I often just end up walking with my bike once I find a good area, because the birds are high up and not always easily observed. 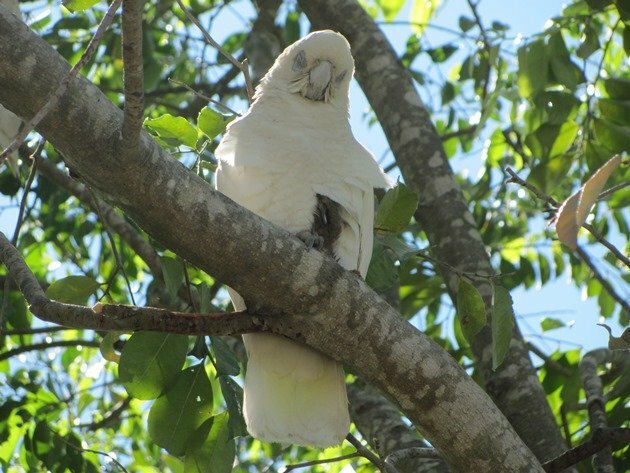 I will hear a snap and rustle and look up and find a variety of parrots and lorikeets. 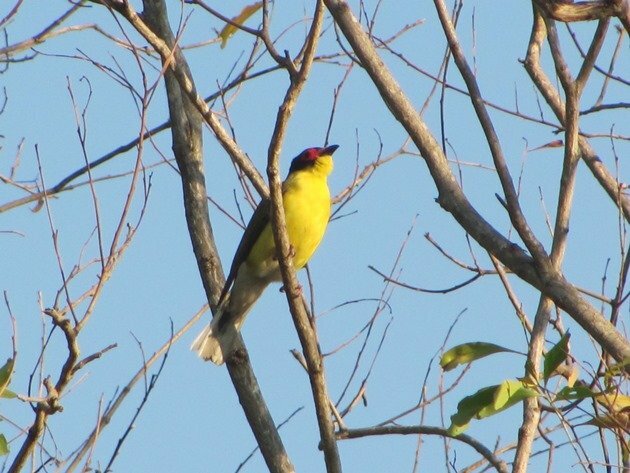 Sometimes I will see a flash of feathers and a variety of small birds flit through the leaves chasing nectar in the flowering trees. There are Bar-breasted Honeyeaters, White-gaped Honeyeaters, Rufous-banded Honeyeaters, Brown Honeyeaters and White-throated Honeyeaters in the flowering trees at present. 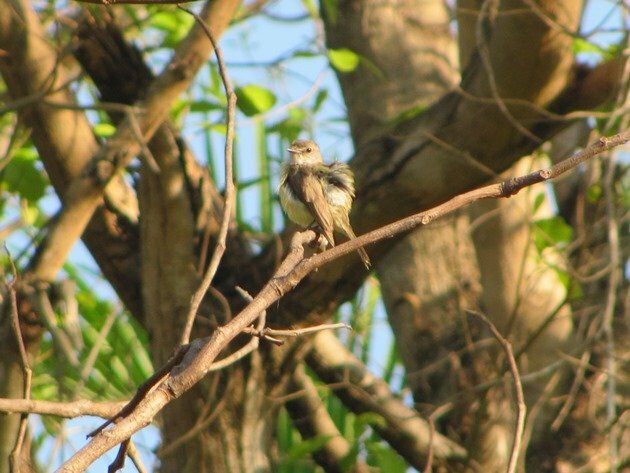 There are Lemon-bellied Flycatchers flitting from tree to tree chasing small insects and making photography challenging! One of the brightest and also rather vocal birds around town currently is the Australasian Figbird and the bright yellow of its feathers and the distinct red eye soon attract your attention. 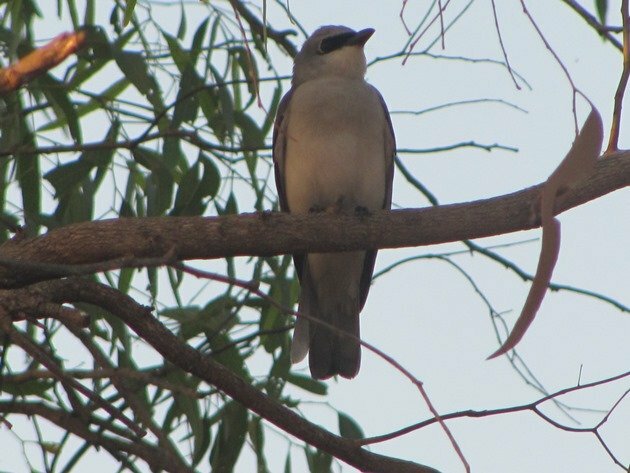 There are Cuckoo-shrikes landing in tall trees with their distinct fluttering of wings and the White-bellied Cuckoo-Shrike is more common here than the Black-faced Cuckoo-shrike. 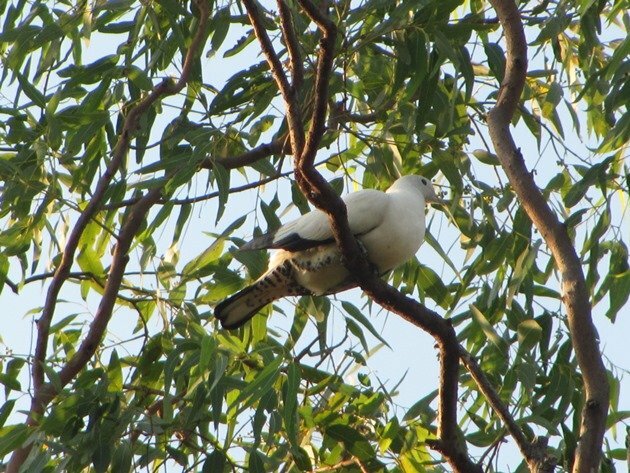 We rarely observed Pied Imperial Pigeons in the urban areas in the late 1990’s, but now a day doesn’t go by when you don’t see several of them. They often attract my attention as they sit high up in a tree and drop fruit (or the remains there of!) as I cycle by. In the evening you hear them calling out and flying across the evening sky. They have really benefited over the years from all of the trees that provide them with fruit. 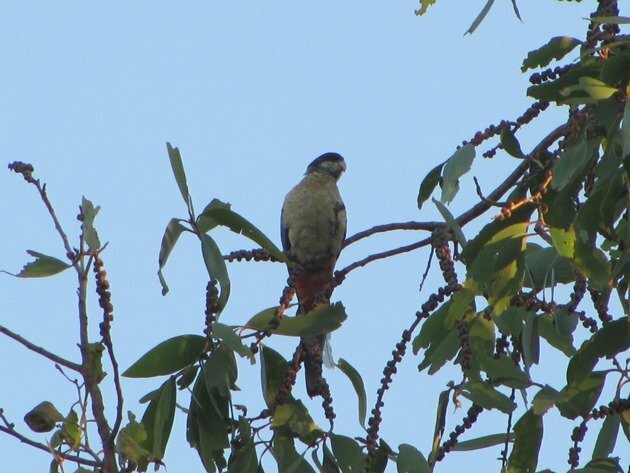 The lakes and lagoons in Palmerston have been of great benefit to the birds and every visit I find new species. I will have to cover the lakes and lagoons in separate posts due to the fact that there are just so many bird species at each water body. Some of the more obvious birds are the ibis, egrets, cormorants and the various ducks, but if you look carefully you may discover secretive birds such as the Nankeen Night Heron perched in trees. I was delighted to find several Comb-crested Jacanas hopping from lily-pad to lily-pad oblivious to my presence. Another surprise was the arrival of megapods to the suburbs! 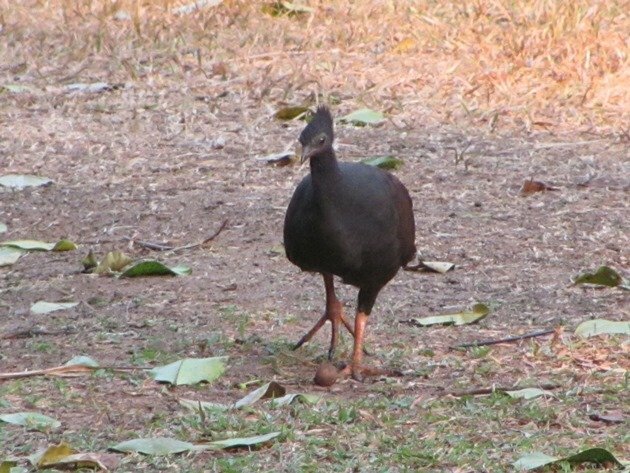 The Orange-footed Scrubfowl has discovered it can live at the lagoon and kick the leaves around looking for food. In fact this species appears to have spread around the area quite well in the past 15 years and is quite easy to find. There are very cryptic birds too! 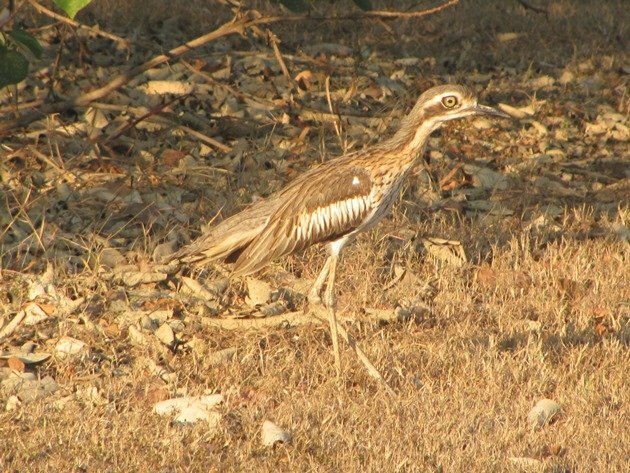 The Bush Stone-curlew is also now at home in the suburbs and wails pitifully at night! It will pose stiffly if it observes you first and remain motionless until you pass by. 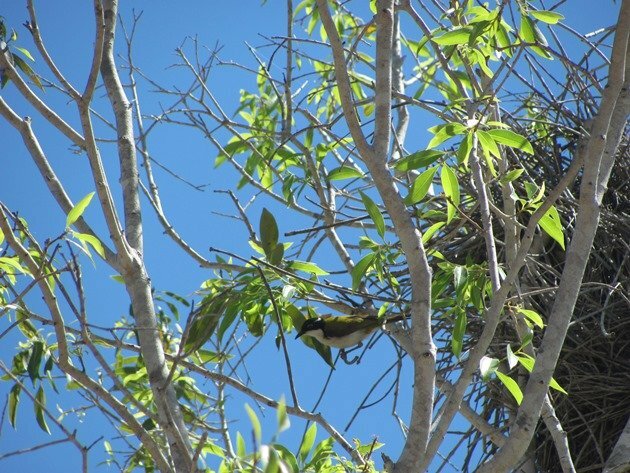 In the short time we have been here we have been able to find over 70 bird species right here in the city of Palmerston. I have been able to find the most productive sites during the day as I cycle around and once Grant finishes work we can return together in the hope of the species still being present. This has proven very successful and often we discover there are other species present in the late evening to add to our ever growing list. Sounds like an amazing place to bird! 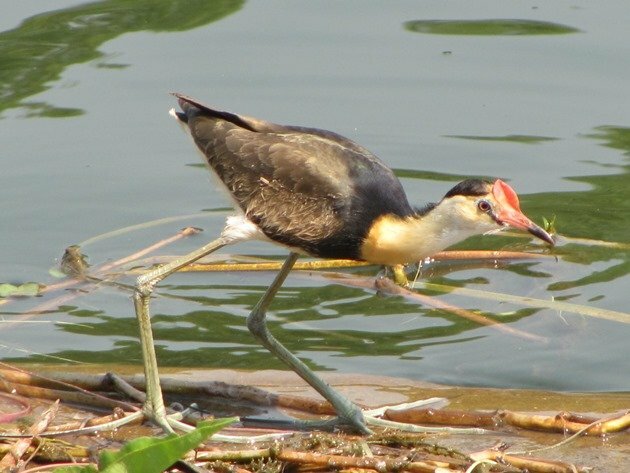 I especially like your photo of the Comb-crested Jacana. Thanks for a great post.